I was flipping through a cookbook the other day and found this recipe that used to be one of my favorites to make. Somehow, I had forgotten about it. How does that happen to such a good recipe? Especially one with chocolate and peanut butter?! I was a little disappointed in myself for letting such a thing happen. I did of course, get them made, and was so happy. It is such a peanut butter delight! It was the first time for Truckin' Man to try these bars, and let me tell you, he was a fan! The oatmeal layer has a lovely texture, topped with the smooth peanut butter, and finally the chocolate frosting! Yum! Preheat oven to 350 degrees. In a mixing bowl, cream the butter and sugars. Add 1 cup of peanut butter, the egg, and vanilla; mix well. In separate bowl, combine the oats, flour, baking soda and salt; add to the creamed mixture. Spread into a greased 15" x 10" baking pan. Bake at 350 for 13-17 minutes, or until golden brown. Cool slightly on a wire rack, about 10 minutes. Then spread with the remaining peanut butter. Now, cool completely. In a mixing bowl, combine the butter, confectioners' sugar, cocoa, vanilla and enough of the milk to get the frosting to the spreadable consistency. Spoon over the peanut butter layer, then spread. *Note: You can use regular or quick cooking oats, but I like the texture better when using regular. **I have found a note on this recipe stating generic or reduced-fat peanut butter is not recommended for this recipe. I have not tested this, and usually use Jif or Planters Peanut Butter. GIRL! I'm making these SOON! Those sound SO good! I need some of those!! MY DAUGHTER HAS WANTED THIS RECIPE FOR YEARS!!! FINALLY I FOUND IT!! THANK YOU FOR HAVING THIS ON HERE!! I made these and the center was uncooked. Any suggestions?? I followed the recipe exactly. Oh my gosh! I am so bummed to hear that :( I did some research this morning on the recipe, and did find a note that said generic or reduced-fat peanut butters are not recommended for this recipe. With that note, just wondering what kind of peanut butter you used? If that doesn't help. I was wondering if you could increase the baking time a little bit? WOW! I have a similar recipe...lost in my files somewhere. Yours look soo tasty. Thanks for sharing at Weekend Potluck - please come again soon. 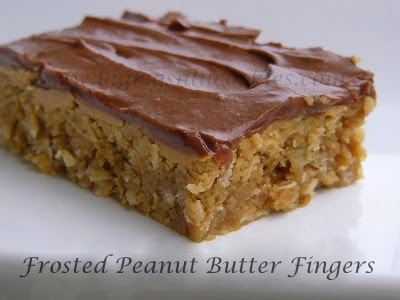 Your frosted peanut butter fingers look delicious! Yum! That extra layer of Peanut butter is probably what puts these over the top. Thanks for sharing! This looks fantastic! Thank you so much for sharing it on the Mrs! I've featured it this week, and I'd love it if you shared another recipe this week! G'day! I would love to try this now!